Our friend and honorary member of the CIHV Poul Strømstad passed away in the spring of 2013 at the age of 92 years. He was born in Copenhagen in 1921 and throughout his life he remained attached to his native town, which formed the framework of much of his research. He studied history and French in the university of Copenhagen, and after his examination (1957), he found employment at the National Museum, where he worked until his retirement in 1991. In the 1950s and 1960s old and reputedly unhealthy quarters of Copenhagen were demolished in order to allow the construction of new and more modern dwellings. Here Poul Strømstad discovered a new field of research, which was the more important as the plans of demolishment would destroy the unique documentation which had survived in the old buildings. He developed an interdisciplinary method, which combined the careful description of the buildings, including the measurement and selection of construction details typical for the building style of the period, as well as their use with research in the archives and if possible interviews with the inhabitants. A synthesis of his studies in this field he published in a brilliant paperread to the workshop in 1991, which compared early modern Berlin and Copenhagen. When in 1974 Kristof Glamann, professor of economic history in the university of Copenhagen initiated a research project on the factory buildings and dwellings of Industrialism 1840‐1940, itwas only natural that Poul Strømstad was chosen as one of its leading participants; his interdisciplinaryexperience and vast knowledge made him a much appreciated colleague. In spite ofthe fact that he taught in the university for only a short period (1965‐1970), through his advicehe contributed to the formation of numerous students among whom today many work in Danishmuseums. His publications show his wide field of interests from the history of urban planning(he was a member of the Danish Committee for the History of Urban Planning/Dansk ByplanhistoriskUdvalg 1980‐2000) over the history of building types to the history of crafts andindustrial history). When in 1970 the late professor Knud Hannestad was invited to join the CIHV as a representativeof Denmark, he wanted to set up a group of Danish urban historians. In spite of his untimelydeath in 1972 the group was constituted in the same year with Poul Strømstad as one of itsfounding members. One of the first tasks of the Danish Committee was to invite the CIHV to Denmark in 1976. Atthis occasion he was co‐opted as a member of the CIHV. In this year and again in 1989 he was one of the leading organizers of the meeting. 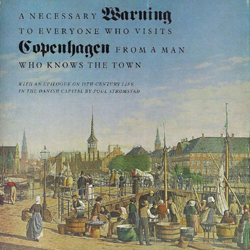 When in 1977 it was decided to make a ScandinavianAtlas of Historic Towns, he engaged himself as an adviser to the authors and as co-authorof the atlas of Køge, a foundation of the thirteenth century. Moreover, he contributed to thepublication on the town’s history, which appeared on occasion of its seventh centenary in 1988. Poul Strømstad attended the CIHV‐meetings regularly, often accompanied by his wife Kirsten. His experience, his knowledge and his common sense lent substance to his interventions in the discussions of the papers read, and his friendly manner won him friends in the CIHV. We have learnt much from him and we shall miss him.